This paper considers the fabrication of a superminiaturized sensor based on carboxyl-modified carbon nanotubes. The possibility of using nanotubes modified by carboxyl group for detection of alkaline metals is analyzed. 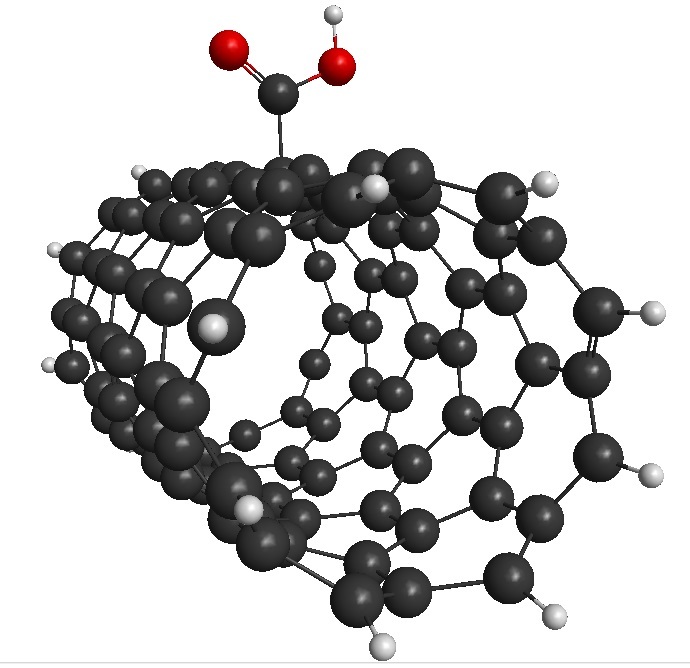 Simulation results have been reported for the binding process of carboxyl group to the nanotube surface and interaction of the nanosystem fabricated with atoms of potassium, sodium and lithium. The simulation has been carried out using the molecular cluster model and the MNDO and DFT calculation methods. Sensor properties of surface and boundary carboxyl-modified nanotubes for alkaline metals have been compared. It has been proved that surface carboxyl-modified nanotubes are characterized by higher sensitivity for the selected atoms. Keywords: carbon nanotubes, sensor properties, sensors on the basis of carbon nanotubes, boundary modified nanotubes, surface-modified nanotubes, carboxyl group.